Amazon’s Prime Air program is really leading the way in development for the autonomous, commercial drone industry, so the announcement of the new prototype is pretty cool. Getting (former) Top Gear host Jeremy Clarkson to help is very cool. 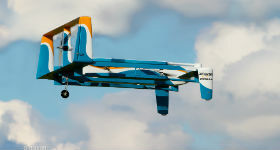 The Amazon Prime Air video announcement offered a vision of the “not-too-distant future” when the company’s delivery drones could save a little girl’s day. The delivery drones will (the company said) have a15-mile range, can drop packages on the doorstep in 30 minutes and can sense their environment so they will avoid potential obstacles like hot air balloons, or whatever is up there. It finds its landing spot thanks to a simple Amazon-logo pad on the grass, lands, and spits the package out of its belly. Then, a vertical takeoff and back into the wild blue yonder to head home, avoiding the Red Baron on the way, I expect. Amazon has had permission from the FAA to fly its drones for research purposes, but hasn’t granted to company any rights to fly them commercially yet. Some folks are saying it wouldn’t be wise to hold your breath. Don’t get me wrong – I love this idea. I want a drone to bring me magic packages from the sky, and I want it yesterday. What I also want is to know that someone with all the technological savvy of, well, me, can’t just shoot it down, or put a net over it, or hack its GPS software in order to steal my package someplace along the 15-mile journey from the fulfillment center to my house. Amazon Prime Air is a little like colonizing the moon, then. It seems like a really fun and cool thing to do. Until you really start thinking about it.